These are a lovely light basic biscuit recipe. I sandwiched them with some chocolate filling. They are a nice easy biscuit to make and enjoy. Prepare two flat baking trays with baking paper. Sift flour salt and custard powder into a bowl. Add milk and mix very firm by hand. Roll out thinly with floured rolling pin. Cut into desired shapes using a 4cm flutted cookie cutter. Transfer to a wire rack until cool. To make chocolate filling sift icing sugar and cocoa powder then combine wet ingredients and stir. This Chocolate Ice Cream Tunnel Cake recipe is from the late 70's and was given to me by a work friend. It is very old school but I have updated the presentation. It is very simple to make if a bit fiddly due to cutting the top off and tunneling through the cake but don't let this deter you. Those leftover bits are absolutely divine and your reward for making this fun cake. Preheat oven to 180C. Grease and flour a 23cm fluted tin. Sift together the flour, cocoa powder, bicarbonate of soda and salt. Set aside. In a large bowl cream together the margarine and sugar until light and fluffy. Beat in the flour mixture alternately with the milk, mixing until just incorporated. Pour batter into prepared pan. Bake in the preheated oven for 50 to 55 minutes, or until a toothpick inserted into the center of the cake comes out clean. Transfer to a wire rack and allow to cool. 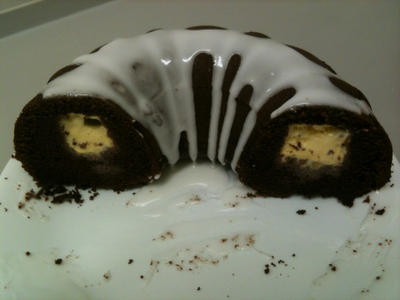 To make the tunnel, first cut a slice about 3 cm thick from top of the cake. Using a small knife, cut away sections of cake to leave a rim of cake about 3cm thick. 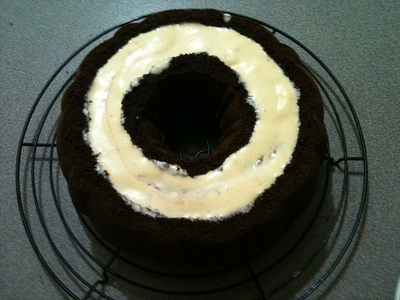 So create a moat in the centre of the cake. Use the kofe to cut away the edges then a small spoon tos coup out the middle. Allow ice cream to soften slightly at room temperature and use to fill tunnel in cake pressing in firmly. Replace top of cake, wrap enitire cake firmly in freezer and freeze until day of party. About 20 minutes before serving take cake out of freezer. To make icing sift the icing sugar then add warm water to form a soft icing. Drizzle over cake. I had a craving for Hedgehog my favourite chocolate slice the other day so did a quick Google search and found this wonderful Hedgehog slice recipe at Stay at Home Mum. I have removed the egg, I am not too keen on eating raw egg. There is also no chocolate in this it is cocoa powder that gives you the delicious chocolate hit. 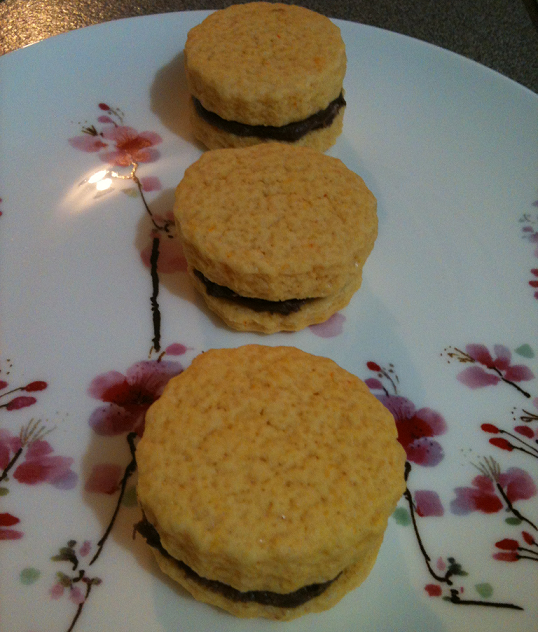 I also chose to use Scotch biscuits for a richer flavour which is a bit naughty but you can use any plain biscuit you like. This recipe will only make a few slices, I just made enough to satisfy my chocolate craving. Double or triple the recipe if you want more! In a medium size bowl sift the icing sugar and cocoa powder and then add the coconut mixing well. Remove from heat and add the dry ingredients to the margarine mixing well to combine. Gently stir in the Scotch Finger biscuits until they are coated with the chocolate mixture. 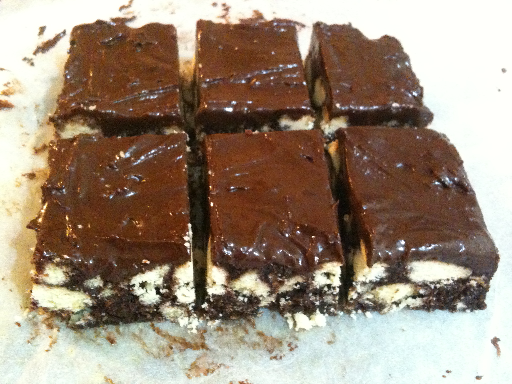 Press the mixture into a lined baking tray and chill for 1 hour. To make the icing sugar sift the icing sugar and the cocoa powder into a bowl. Add the hot water and mix to a smooth paste. Then spread over slice and chill for another hour. To cut use a warm knife - heat knife by running under hot water and wiping clean.